Annual survey results announced today by AIIM Europe, the Enterprise Content Management association, indicate that whilst 63% of respondents state their intention to use MOSS (Microsoft Office SharePoint Services) for document management, and 41% for records management within the next two years, only 34% have a formal plan outlining how and where it will be applied. In order to address this uncertainty, the forthcoming AIIM Roadshow features a SharePoint Solutions Theatre where Microsoft will present the standard features of SharePoint for management of projects, documents, records, emails and web-content. Other ECM suppliers will give examples of how integration of their products with SharePoint has already produced a value-added solution for users. The AIIM Survey also shows that 28% of organisations plan to migrate their content repositories to a single ECM system over the next two years, whilst a similar percentage plan to join their repositories together under a single sign-on portal. Half of these intend to use SharePoint as the integration platform. Only 9% are looking to use Enterprise Search alone as the integration mechanism. 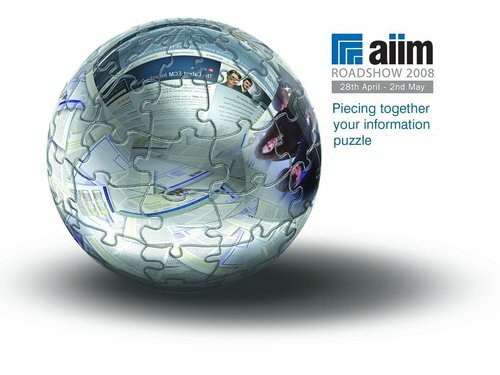 AIIM will address these issues and many more at its 2008 AIIM Roadshow, which visits five UK cities – Glasgow, Bolton, Coventry, Bristol and London – from April 28th to May 2nd. This year’s educational theme is “Piecing together the Information Puzzle” and industry experts will deliver information and advice throughout the week. Over 30 suppliers will demonstrate document, email and records management software along with document scanning and forms recognition systems. Registration for this free event is at: www.aiimroadshow.org.uk or call 01905 727606. The 2008 AIIM Roadshow will visit Glasgow: April 28th, Bolton: April 29th, Coventry: April 30th, Bristol: May 1st and London: May 2nd. AIIM is the international association for Enterprise Content Management. It represents the Information Management community and supports the interests of users and suppliers of technologies and solutions used to capture, manage, store, preserve and deliver information. This press release was distributed by ResponseSource Press Release Wire on behalf of Nicola Cowburn Independent Marketing & PR in the following categories: Business & Finance, Computing & Telecoms, for more information visit https://pressreleasewire.responsesource.com/about.